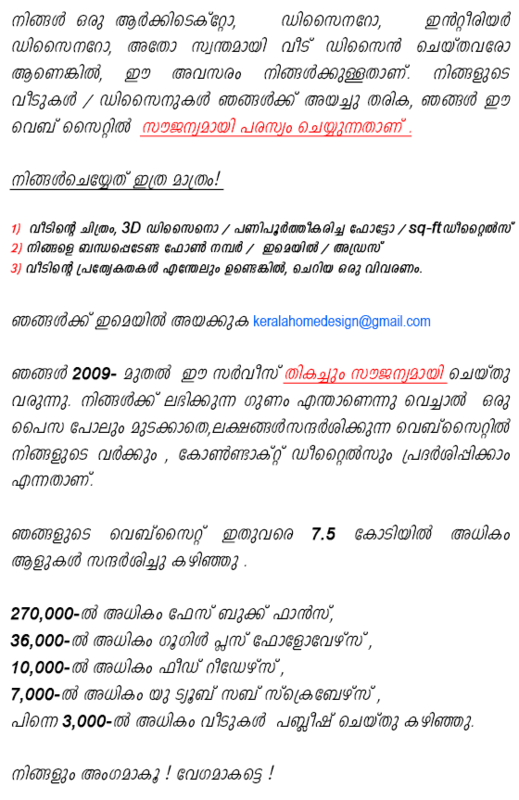 If you want to sell your home/villa/flat, then send the photographs + square feet details along with the contact details to keralahomedesign@gmail.com. Thanks for your kind visit and enjoy your stay! Our blog have over 7 crores hits/since inception and have over 270,000+ fans in Facebook. So you will get more mileage. 15 comments on "Submit your house design works"
If I have a query about my house being constructed by a builder, can I clear the doubt with you? If yes, plz let me know your email ID to send the query. Oh thanks to you for giving us a great opportunity for showing us house design. Actually, I am very happy to know the handy article which is very essential for me as well. keep it up..
We express our sincere gratitude for giving us the opportunity for publishing our designs in your website. Wanted help to find architect of contemporary house building for my self. I saw design which can be whatsup to you published some months back but no contact details given.I can be reached on get2harkirat@gmail.com and on 9311151234 call and whatsup number. Dear, Please send to me on e-mail sshakeelg@gmail.com the three storied rental house plan 19x50 with one car parking, 19 feet facing to road side. 3d thanks. I have a plot measuring 30x38 facing west. I want build a duplex house around 1400 sq ft. please send me design as per vaastu. I have a300 sq mtrs plot & want to build a G+3 with car park for rental provision. If u plan it?